When this web site was created in 2002, it was exclusively an amateur astronomy and stargazing site -- hence the title and domain name. Although the site's focus has broadened, I like the title and domain name and therefore am keeping them. Since turning 70 in 2010, I've been gradually disengaging from some commitments and re-directing my attention and energies. Thus in some of the following, I am now retired or semi-retired (as indicated). From 1990-2012, I was author of the "Stargazer" column which appeared every other week in the Waco Tribune-Herald and some 60+ other newspapers. Most of the 587 columns (except 1993-1997) are archived and can be read at STARGAZER COLUMNS. The monthly sky calendar which was a feature of this site for several years has been retired. The web sites of Sky & Telescope and Astronomy magazines have sky calendars and a wealth of other information -- check them out. (A Beginner's Guide to) Learning the Night Sky, 3rd Edition The rights to this book have been donated to the CENTRAL TEXAS ASTRONOMICAL SOCIETY from whom it may be purchased. Stargazer's Life List Hard copies of this boook are out-of-print, but .docx and .pdf e-copies (not Kindle) are available at no cost using Dropbox. You may read about this book and download it at BOOKS. You can find some basic stargazing information, especially helpful to new stargazers, at INFORMATION. 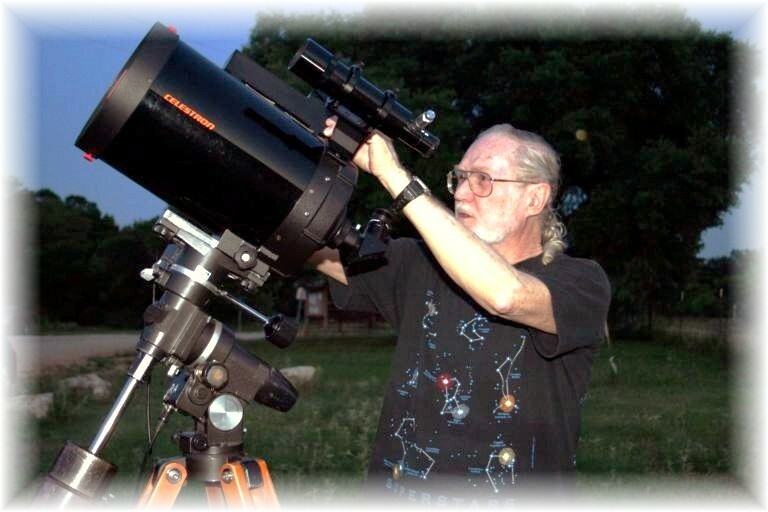 Paul is an active and charter member of the CENTRAL TEXAS ASTRONOMICAL SOCIETY which owns and operates the Turner Research Station near Clifton, TX. TRS is the home of the Meyer Observatory which houses a 24-inch robotic research-grade telescope. NOTE regarding Dropbox: Documents cited herein are available free via Dropbox where they can be downloaded onto your computer. You need NOT have a Dropbox account, and the service is free. So that you can find the downloaded files, note into which folder on your computer the files are downloaded; depending on your operating system you may be able to direct the files into your folder of choice, or they may go into your general Download folder. Once downloaded, they may be read on your computer and/or printed. Having been a devout Christian in the early part of my life, for the past 45+ years I have been an agnostic secular humanist. I am also a member of First Unitarian Society of Denver, and before moving to Denver in 2014, was a long-time member of the Unitarian Universalist Fellowship of Waco. I am also a member and supporter of the American Humanist Association. As a non-religious yet reflective humanist, for some time I sought a humanist-oriented daily reflections-type book. When all I could find were religiously oriented books that did not met my needs, I decided to create my own DAILY REFLECTIONS - a compilation of a full year of widely varied readings for daily reading and reflection which speak to my humanist and liberal social philosophies, and which are available for download via Dropbox. Over the years I have made many presentations to UU congregations around Texas which might be of interest and are available for download. See some of these PRESENTATIONS here. From time to time I have given other presentations, and I have created and presented a Janus Legacies Life Planning workshop and workbook. See more about these OTHER PRESENTATIONS here. Also a breast cancer survivor, Jane has written See Jane Beat Cancer: A Guide for the Newly Diagnosed. In her book she relates the story of her journey from diagnosis (triple-negative breast cancer in 2012), surgery, chemotherapy, radiation and back to health by adopting an anticancer diet and life-style including a variety of mind-body techniques. The Kindle version is available on Amazon.com for $2.99. The paperback edition is also available on Amazon.com for $14.95 (plus postage), or may be purchased directly by sending a check or money order for $17.95 (price + $3 shipping) to BirdStar Press, 3119 N. Josephine St., Denver, CO 80205. Also check out her website at seejanebeatcancer.com and her Facebook page under See Jane Beat Cancer for availability updates. Some 10 years ago I compiled family histories of families of my ancestry. Being a writer rather than a genealogist, I utilized a wealth of information, photos, and documents researched and collected by my mother, Flomar Cushing Derrick, and aunt, Bernadine Derrick Field. Families include Derrick, Gordy, Bock/Dischinger, Cushing, and Walsh/Smith/Goodnight. Also available are "William Paul Derrick II, A Personal History from Birth to Marriage" and "Jane Carroll Derrick, A Personal History from Birth to Marriage." Should you have family or genealogical interest in any of these histories, they are also available via Dropbox. Email me at paulderrickwaco@aol.com and I can send you the link(s). Paul is deeply indebted to his friends and fellow stargazers Patrick Hanna of The Woodlands, TX and Sam Alexander of Waco, webmasters par excellence, for their invaluable assistance in the development of this Web site. 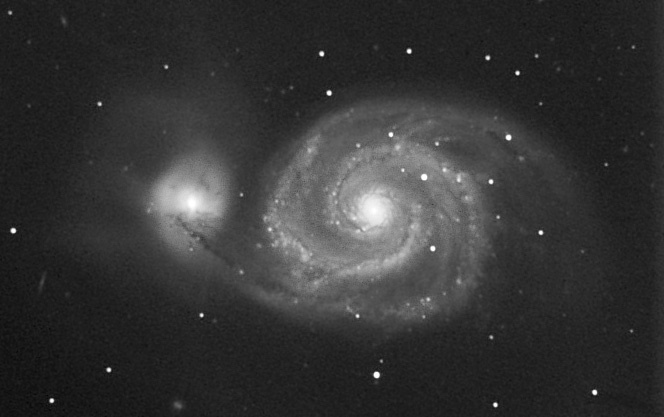 The beautiful background image of M51 (interacting galaxies) is used courtesy of George Kidwell of Waco, amateur astronomer and fellow member of the Central Texas Astronomical Society. Thanks guys!